Taking that much needed vacation is going to provide you with hours of relaxation and enjoyment, but are your teeth safe? There are several hazards of traveling that people overlook when it comes to their teeth. Leaving your area and visiting another location can cause havoc on your teeth if you are not accustomed to the type of water they use or the acidity in the local cuisine. When visiting other locations you should always keep in mind that what you eat can take a toll on your teeth and stomach. Sometimes eating different cuisine that you are not used to can cause your stomach to become upset and force you to throw up. This can bring all of the stomach acid up and cause it to latch on to the enamel on your teeth. Foods that are high in sugars will need to be followed by a mouthwash rinse. If not, it could result in bad breath or damage to your teeth. Snacking is fun to do. Snacks are great to have on hand when you can't eat a whole, healthy meal. They can be great fillers, but can also provide your mouth with unneeded bacteria. When you are snacking a lot and not brushing frequently during those snacks it can cause the food particles to attach to the enamel on your teeth. This can create a buildup of plaque, which increases the risk of staining and cavities. You are also at a high risk of cavities and staining when eating things such as toffee and hard seeds. The seeds and other hard foods can cause pitting in the teeth. Even though it's a regular routine to brush your teeth twice a day for at least two to two and a half minutes, while traveling, it's even more important to stick to this routine and even add in a few extra brushes. Keep in mind that when brushing your teeth, the toothpaste is only an aid. The real hero is the bristles on your toothbrush. 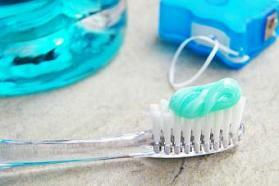 Therefore, when packing your toothbrush be sure to pack it in a container that does not squish the bristles. What Dental Products Should I Pack? • Toothbrush: The toothbrush that you carry should be either a regular one that you have as an extra at home or a portable one that is used for traveling purposes. • Toothpaste: The toothpaste that you use should have fluoride in it. This may not be available at the location that you are traveling to. It is smart to pack a tube just in case. • Mouthwash: A small travel sized bottle of mouthwash should do for a week or less stay. Be sure to purchase the mouthwash that has fluoride in it if you are visiting an area where the fluoride levels may differ from those in your home location. • Dental Floss: As with any meal, a toothpick or dental floss is always a necessity because food can get stuck in between teeth where a toothbrush might not be able to reach. • Whitening Kit: You may want to continue a whitening regime while traveling that you are using at home. If you have a special kit that you purchase, it is best to have an extra one with you. Not all locations will have drug stores or pharmacies like you are accustomed to. For more tips on taking care of your teeth while traveling, or other dental concerns, please contact our office at (425) 216-3367.